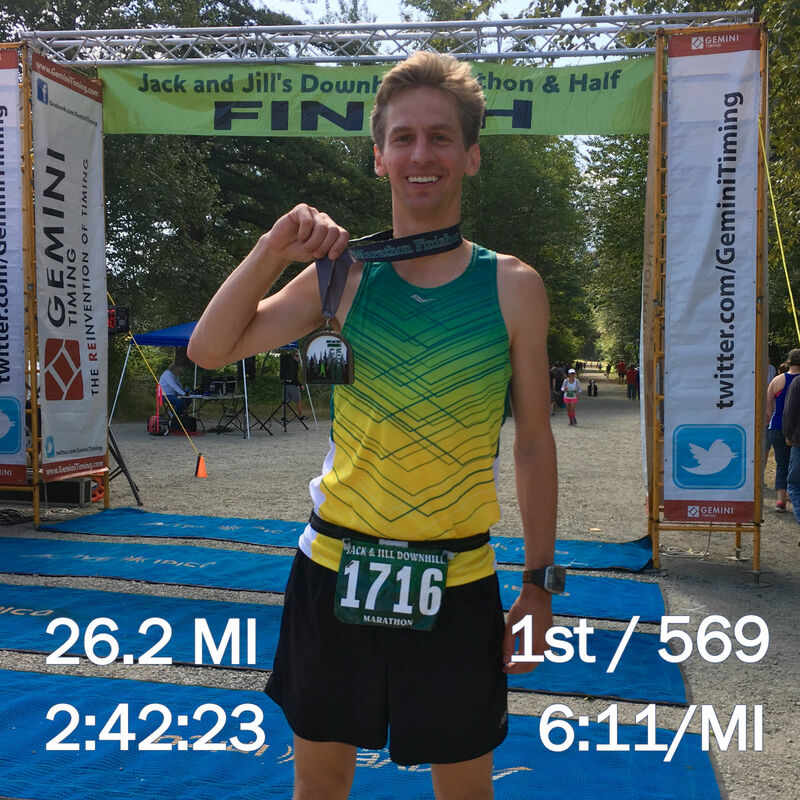 On July 31, 2016 I raced my first marathon. I finished in a time of 2:42:23, taking first place in the race. Here is the race report. Compared to the Ironman I did in 2014, this race was relatively quick and not quite as grueling – but it was much more intense and there was far less margin for error. To put numbers to that – during my Ironman my average heart rate was 137 BMP or about 74% of my maximum. For this marathon it was 166 BPM or 90% of my maximum. Nonetheless, my finish time of 2:42:23 was fast enough to lock up first place overall, putting me ahead of 568 other finishers. 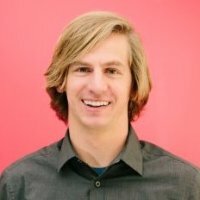 According to athlinks.com, that time puts me in the top 2.6% of marathon finishers – which itself represents only about 3-4% of people. The following is a detailed account of my race. It is long. This is my way of paying it forward to future athletes & documenting it so I can remember later on. The day before the race I picked up my packet, did my warm up run on the course to check out the tunnel. Though I should have it much earlier, I also used that day to test two new pieces of gear. The first was my foot pod – a device that goes on my shoe to track turnover & record distance in the case GPS goes out – which it would during the tunnel. The second was my flashlight – to make sure it was bright enough to run with. I brought two just in case. As always, I laid everything out the night before to make sure I didn’t forget anything. It worked, I didn’t forget anything. I woke up at 1:30AM. I had planned to sleep until 4:30 – but I was nervous and after spending an hour trying to fall asleep again decided to just rest & read. I had breakfast at 4:30 and left the house at 5. Race morning breakfast was, as always, peanut-butter & banana on a plain bagel. I have eaten that same meal for every race since high school and it has never failed me. I drove 40 minutes to the parking lot, which was at the finish line and got on a school bus to go to the start line which was about 20 miles away (the course isn’t perfectly straight). Point to point races dictate this type bus drop off logistics but I feel it is generally stressful. In the future I’ll strongly consider loop courses where you can get yourself to the star/finish. That said, the bus ride was along I90 which is a beautiful mountain pass with trees, towering mountain peaks and flowing rivers every way you look. We got to the start line a bit after 6:00am and had a while before the start time of 7:30. I did a really light half mile warm up, a few stretches and a handful of leg exercises to wake everything up. Most marathon runners don’t warm up – it is a long enough race that there is plenty of time to get warm and saving energy is more important. Unfortunately I can’t go from cold to six minute pace without a bit of a warm up. Sometimes a race is big enough that logistics necessitate bringing ‘throw-away’ clothes you can strip out of at the start & discard. This race was so low key that I ended up stripping down minutes before the start & tossing my bag into the back of a truck at the start line just in time to line up. With that in mind I was surprised to see a bunch of people shivering or wrapped up in garbage bags. Note to any future marathon runners, spend $15 on some cheap sweats or at least make use of your drop bag to keep you warm for 70 of the 90 minutes before the race. It isn’t worth it to burn that much energy being cold & shivering. As I approached the start line I saw the pacers with their signs. The first corral was labelled ‘Sub 3:45’ and the fastest pacer was holding a ‘3:05’ sign. I asked if anyone was going sub 3 and a few people put their hands up. I said I was trying for 2:40 and they all said ‘good luck’. I had suspected I would be running solo but had hoped I would get lucky and have one or two other people around my time show up. When the gun went off, I took off at something close to 5:45. I wanted to go slow, but race nerves kicked in. It took me a bit to settle in to my planned 6:15 pace. I’ve run hundreds of races over the years and one thing that is consistent is that someone (or a few people) always goes out too hard. I love to watch the front runners and figure out who is going to drop. This didn’t happen in this race to the degree it normally does. There wasn’t anyone way out in front that couldn’t hold on. That was nice to see. Half a mile into the Jack and Jill marathon, the course enters a tunnel. It is a 2.3 mile long, pitch black, perfectly straight, damp & cold, former train tunnel that is about 25 ft high and 12 ft across with a crushed rock floor. I have never run in anything like it (minus the test the day before). As I entered the tunnel I turned my headlamp on and then immediately, the light dimmed. My batteries were dead, but it took me a second to realize what was going on. Meanwhile I was moving at six minute pace in a pitch black tunnel. I stepped in a puddle and got one foot soaked. The night before I had been talking to my wife about my practice run in the tunnel and which of my two head lamps I was going to bring. I commented that it was important my light worked, because unlike middle pack runners who would have light around them from other runners, there was a chance I would be in front. Just to be safe I decided to bring a second light. I turned on the other light and put it on my head. This was my backup light because it wasn’t as bright, but it was enough to see the ground in front of me so I could avoid rocks. The trouble with a head lamp & running in a cold tunnel is that your breath fogs & rises, getting in the way of the light so that it reflects back at you. You essentially go blind every exhale. On account of that, the puddles and general creepiness, I remained pretty timid through the tunnel until I got closer to the other side. Once we got to the other end the light from the other side started to make it possible to see again. As I got closer to the exit I could see the outside and it seemed surreal. A low hanging fog was stark white and I could taste the pine drenched mountain air. I was so relieved to be out of there. I tossed my lights into a box they had set up (for the record I am really good and tossing things into boxes and trash cans at full speed) and tried to get into my rhythm. That 3rd mile was rough. My heart rate above my target (171 vs 165) and my pace was ten seconds slower than goal (6:09 vs 6:00). I had my first gel at the 3.5 mile mark. When I got to the first aid station I surprised the volunteers who weren’t ready for me and we botched a cup handoff. I was really worried it just wasn’t my day and my morale was pretty low. Over the next two miles I really focused on turning things around mentally and getting into my groove. Calming down and settling in for the long haul. It was working – my heart rate dropped to 166 and my pace dropped to 5:58. Everything was back on track. At this point I could help but enjoy the scenery. The race was on a trail on the side of a mountain overlooking a big canyon with a highway and river running below. In the distance, tree covered mountains line as far as you can see and a few jagged, rocky peaks stick out periodically. There was a light cloud cover and some hovering low fog. Along the trail there were wildflowers in bloom and small creeks running down towards the river below, periodically stopping to fall over rocks. Truly a beautiful place to run. Target pace at the 5 mile mark would put me at 30 minutes flat. Instead I was closer to 31. I was one minute in the hole from those rough first miles, but I had 21 miles to make up the difference. My plan was to have off a few seconds per mile while keeping my heart rate around 165-167 until mile 10 so that I didn’t burn too much energy. At mile 10 I would do the math to see how much more time I needed to cut per mile and shift to hitting splits, regardless of heart rate. My hope was to cross the 20 mile mark at exactly two hours – that way all I had to do was finish the final 6.2 miles on pace. Mile six I lost 20 seconds to stop and pee. Despite having peed while running before, something about race day nerves and moving at sub six pace made it too hard to do. It was the right call though, I felt much better and my next five miles averaged 5:56 with a 167 heart rate. I was making up time. I had gels at mile 7 and 10.5 – right on schedule. As I hit aid stations I would refill my water bottle. I holds about 8oz and I believe I went through 5 or 6 of them during the race. The first times I stopped to pour cups into them but eventually realized I could refill with the water jug. I would stop to do this, wasting about 8 seconds, but my thought is that was worth it to have continual access to cold water. As I got closer to the half way mark I started to notice that my GPS was no longer in sync with the mile marker cones. At first they had been lined up almost perfectly. In fact a few times the GPS was late, meaning I was running faster than my watch said. But by mile 12 a gap was forming. I crossed the half way timing mat at 1:20:19. But a few minutes earlier my watch had told me I was at the half way mark – closer to 1:19. Not a huge difference, but I realized things were a off. In retrospect I can see that my GPS recorded extra distance by periodically recording my place as of the trail to one side or the other. That meant little bits of extra distance were added. It turns out GPS tracking doesn’t do great in heavy tree cover. 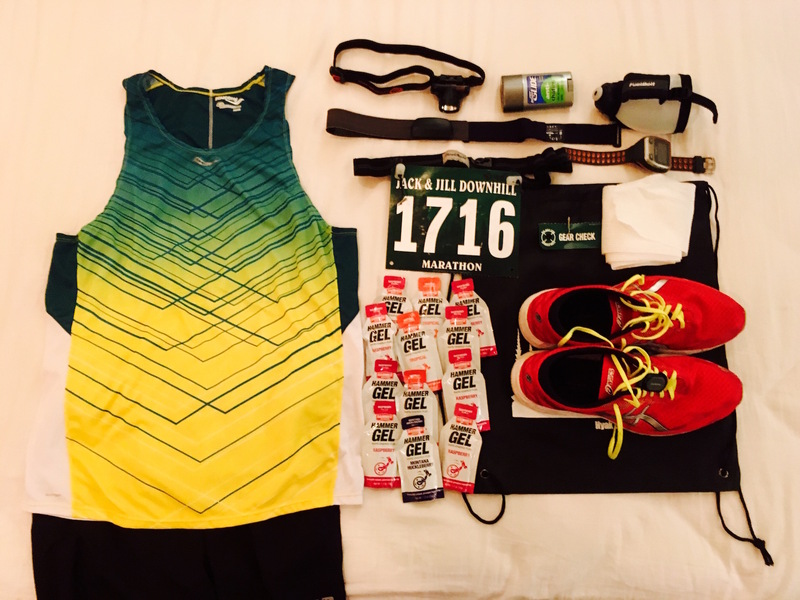 To hit my goal pace would require a 1:17 second half – an average of 5:50 per mile. Not impossible, but it would require staying under six minute pace and then finishing we a few low 5s. The contingency plan was a sub 2:40 finish which would only require me to hit a 1:19:40 – just a tad faster than my first half. I had another gel at mile 14 and over the next 5 miles I thought I was doing great. My GPS had me averaging 5:54 on 169 BPM. By this point the mile marker cones were about 0.3 miles off my watch though. I wasn’t sure which was wrong at the time but in retrospect I now know I was running closer to 6:02 miles. Instead of making up time on my 6:00 pace goal, but in reality I was continuing to lose it. The longest I had ever run at this effort was 15 miles in a workout a few weeks prior. Once I crossed that, I was in new territory – all pain would be new pain. I still had 11 miles to go though. Around the time I hit the 18 mile mark and had another gel, I started really hurting. My heart rate had crossed over 170, which I was trying to stay under, so I backed off a bit and turned in a 6:02. It was around the same time I passed the first half marathon runner. From this point on I was overtaking runners on an ongoing basis – more every mile. While it was nice to have some encouragement, getting around them on the trail was one more thing to think about. Mile 19 was even worse, it was a 6:12 and my heart rate was now only 166. My body wasn’t working as hard as it had been, but at this point of exhaustion, it felt much harder. This is the point at the race I feel I could have benefited the most from another runner or a group moving at the same pace. After about two hours of working at >90% of your maximum effort, little things take so much more energy. Watching your footing for rocks, staying on the right course, turning over your stride fast enough, remembering to sip water, setting the right pace, breathing, keeping your form in check. The benefit of having someone to run with or behind is that you can just focus on staying close to them which takes a few things off of your mind. It lets you focus inward on one thing – form or breathing, which in turn helps the others. 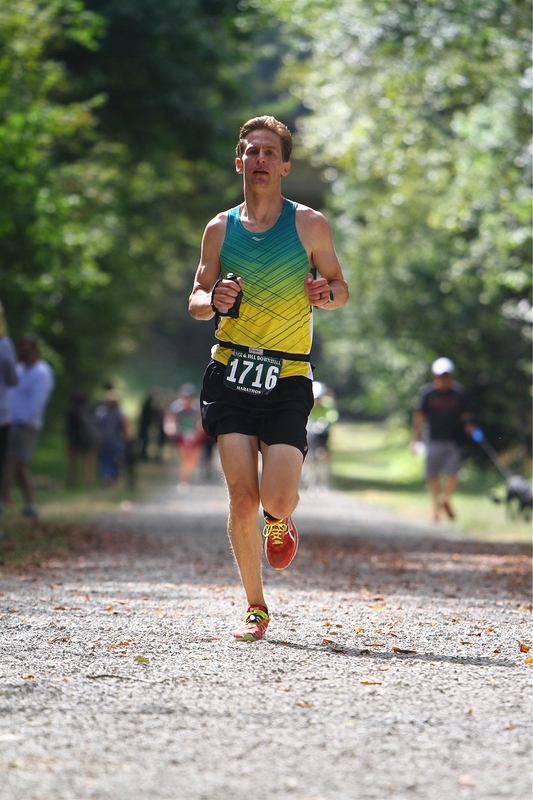 Running fast solo is really hard – that is why runners going for records often try to go to races with others trying to break that same record – they want someone to run with. In this race, the second place winner was about six minutes behind me. I literally ‘beat them by a mile’. That feels nice, but isn’t ideal when you’re racing the clock – in that case, company is welcomed. Miles 20 to 24 were more of the same 6:15ish pace and only 166 BMP. 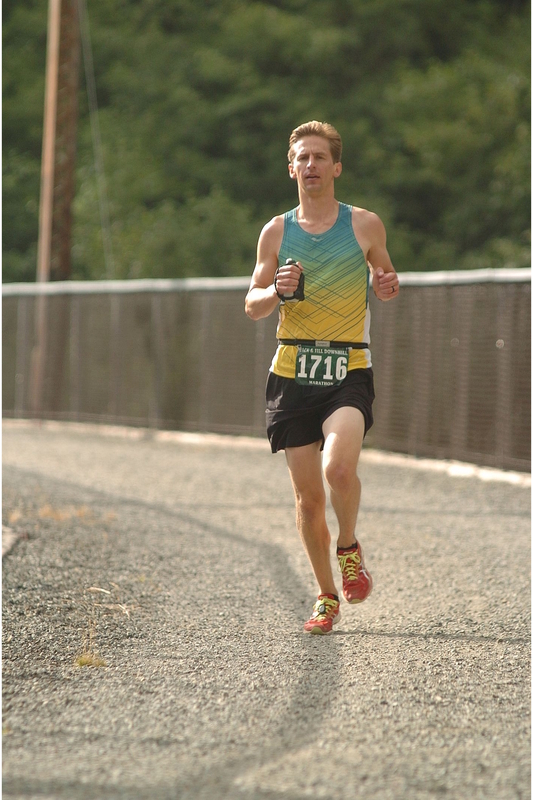 By this point I had given up on 2:37, which would have required 5:30 miles and shifted to trying to stay under 2:40. I thought I could just grit it out for a few miles and then finish strong. Somewhere in there I had a gel – my 8th and final of the race. Hurting. Breaking down. Ready to be done. My last two miles really painful and really hard emotionally. I was gritting it out, forcing myself to keep moving, uncomfortable everywhere, blisters on my feet, salt hardening on my body as my sweat dried in the sun. I had long given up on hitting my goal, and was just trying to minimize the damage to my finishing time by moving at whatever pace I could muster. I was sure the next runner was coming to pass me – I couldn’t yet see them over my shoulder, but two miles is a long way. It is hard to describe the feeling of winning a race while failing your goal. On one hand I was winning. 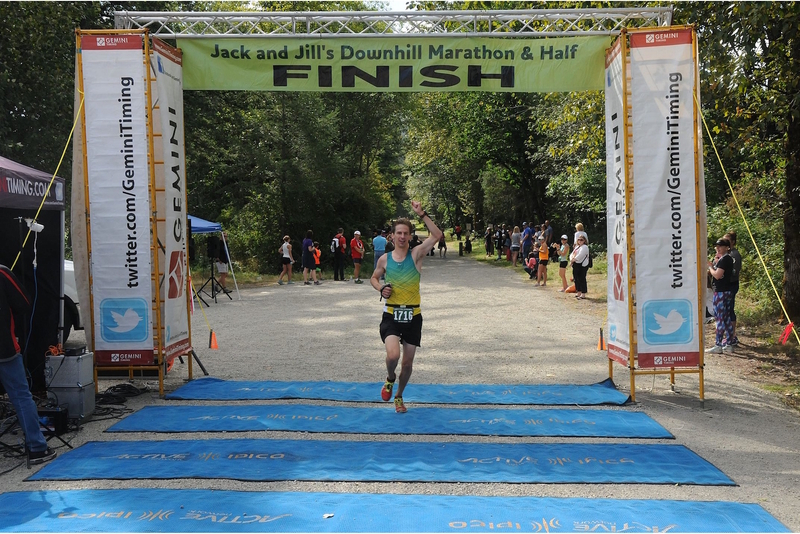 As I approached the finish line everyone was cheering. In an absolute sense – no one that day ran faster than I did. I was also finishing my first marathon and had successfully trained enough to get myself in the shape where that pace was possible. That is a big accomplishment. On the other hand, I knew my 2:42 wasn’t a real 2:42. This course was downhill – it was faster than a flat course. How much of an advantage was that? 3 minutes? 4? I don’t know exactly, but it didn’t feel quite the same. It felt like I would need to run another one of a more normal course to get a real time. A victory is a victory, but a finishing time has a lot of context in it and this course had a lot more context than others. Not to mention, I was moving nearly a minute slower per mile than I had been earlier that day. I had failed to achieve the goal I thought I was capable of that morning. I had failed to achieve the goal I thought I could hit 13 miles in. During the 8 months since I set my ridiculous goal, I had gotten close enough to it that I thought it was within reach and now I was missing it. It didn’t have the feeling of a good race, of finishing strong, of doing my best. I think this picture perfectly captures it. There is a half excitement there. I will be more excited on the day I finish in 100th place but put up an effort that I know is my best. I have work left to do. I hung around for about an hour after the race. I cheered on the other top runners while trying to replenish calories & fluids. I was exhausted. I couldn’t walk properly for the few days after the race. It took until Friday before I could walk down stairs without holding on with both hands. If accomplishments were measured in imobility the week after, this was a big one. This was the most significant race I have ever won and along the way I realized a few things. I offer this to anyone leading a race like this in the future. If you are running in a dark tunnel, and in first place, you need to have the brightest light. I didn’t predict this one. Essentially your body will cast a shadow from all of the lights behind you. Your light will be the only thing lighting up the area in that shadow and that area is where your feet will hit. If the area outside of your shadow is brighter than the area your light illuminates (as it was with me) you won’t be able to see your footing due to your eyes adjusting to the brighter light around your shadow. My solution was to run faster, which put me farther away from the other lights and thus evened out the difference. As I approached each aid station during the first 13.1 of the course, I was the first runner they had seen that day. They often had their tables set up but had not yet started manning them. Many of them, volunteering for the first time, didn’t yet have the system down. They would get it down with a few tries, but I was the first pancake. I realized this at station one and from there on started yelling notice as I approached and gave specific instructions – ‘I need two cups of water’. You represent something very specific to the half marathon runners. On courses where the marathon overtakes the half marathon, the first marathon runner becomes a symbol of sorts to the slower runners in the half marathon. Some of them hope to finish the race before they are caught, others use it as a marker for how they are doing, some are just excited and inspired. Either way, you will get a lot of questions, verbal realizations, cheers, etc. In total I passed 1/3 of the half marathon runners on the course and the breadth of reactions was a unique experience I am glad to have shared. It wouldn’t be a Greg post without a few charts. Here are a few of the interesting bits from this race. 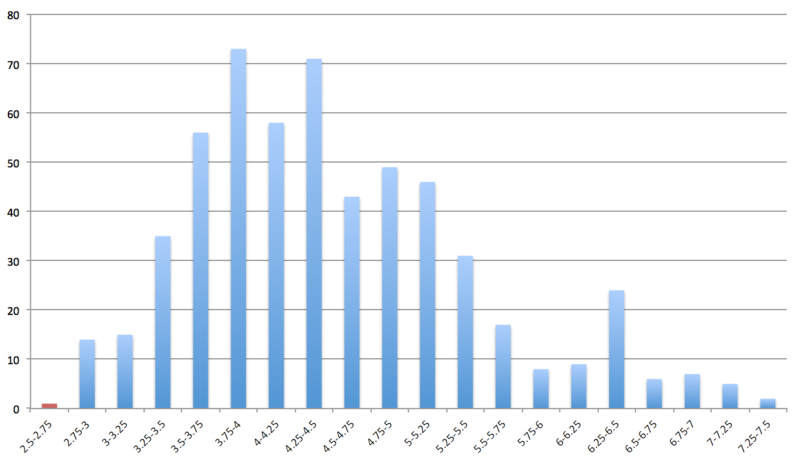 One of my favorite charts is breaking down the finishing times to see where I stack up on the curve. Here I split things into 15 minute increments and you can see my bar in red on the left. Count of one. Really interesting to see that spike around 6.5 hours – I believe that was the cutoff, but it appears a few people snuck in afterwards. There is also a noticeable dip around 4 hours – perhaps a number pushed to get under the 4 hour mark. I mentioned earlier that no one went out way too fast at the start. That being said, very few people had a faster second half. This chart shows the first half split vs second half split. The gray line represents even splits. It turns out almost everyone was slower during the second half, with a few runners that were just slightly faster and a few outliers that really hit the wall hard. I’m the red dot below, my splits were 1:20:19 and 1:22:04. Pretty even – only 2% different. 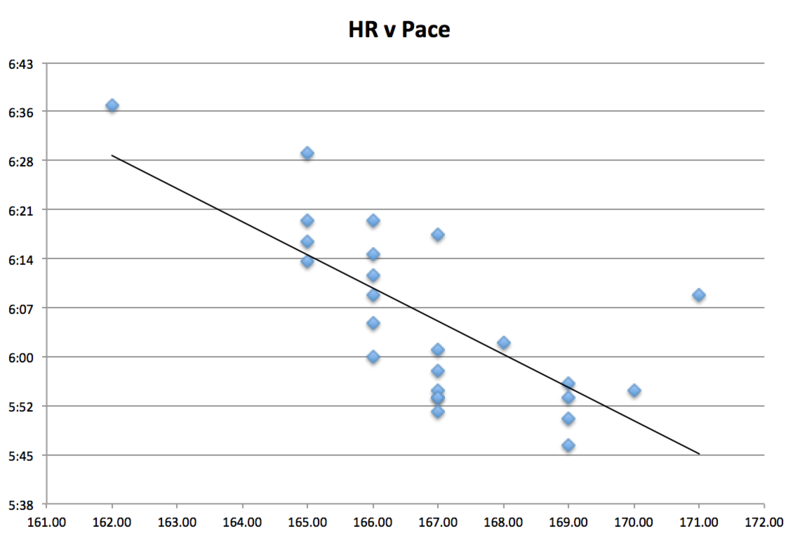 Here is my pace (blue), heart rate (red) and foot turnover (pink) during the run. You’ll notice it looks pretty steady. As we zoom in you’ll notice a few distinct sections – the ramp up & tunnel (1-3), steady work (4-18), crashing (19-25) and the finish (26). Ignoring a few of the larger spikes that are likely caused by GPS errors, the general trend is a curve that increases until half way and then decreases. My perfect race would have slowly gotten faster until the end. My goal in terms of heart rate was to stay under 165 until mile 10 to save energy. After that, stay on pace but allow up to 170. At some point I would make the call to go all out and do whatever it took to finish – likely putting me in the 170s until the last mile where it would have been 180s. Early in the race I was working hard to keep my heart rate down, but you can see it popped up a few times – like mile 3 and 6. Around mile 17 the opposite problem starts to happen. I should have been pushing harder there to keep at pace, which would have been around 170, but I slowed down and it dropped. I did push it in to the finish though. This is my foot turnover, or cadence, the steps per minute I was taking. A normal trained runner will be around 180. I usually run closer to 175 – longer legs, slower turnover. The goal is to keep it pretty steady, regardless of pace. Because this race was downhill, I actually wanted to keep it around 190 because more steps means less impact on each step. The slower start is me not yet getting into my groove. The dips are me stopping to fill up my water bottle or pee. The slow decrease in cadence from mile 10 onwards is me becoming fatigued. I should have kept a better eye on that, focusing on keeping that higher might have shaved some time off my race. This next chart is one of my favorite data points. For all of the words I’ve written, marathons are really simple. You run as fast as you can without running out of energy before the finish. The faster you go, the harder you work (reflected in heart rate) and thus the more energy you burn, so you have to time it just right so you crash at the finish line and no sooner. 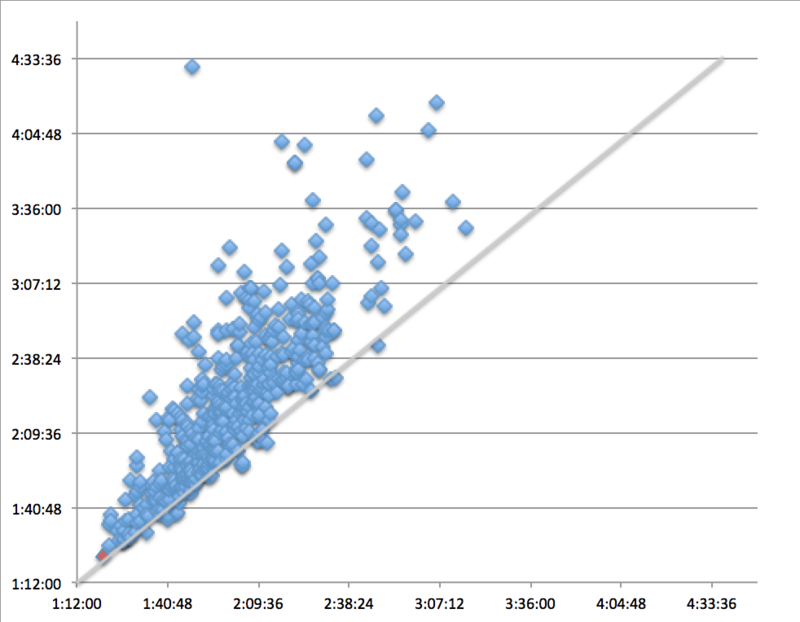 Here I charted my pace and heart rate from mile 2 to 26 and what we can see is a nice linear chart. Regardless of while mile, my heart rate on any given mile correlates really closely with my pace. You can see that in order to hit 6:00 pace for the race, I would have needed to be at 168-169BPM on average. I actually averaged 166, which put me at 6:11 pace. In order to do that I would have needed to have my heart rate be 6 BPM higher on each mile over the last eight miles. Easy to write – much harder to do. So to go faster, there are basically two things to do. The first is to be able to run at a faster pace on the same heart rate. This happens by training more. It happens in the months leading up to the race. The second is to be able to sustain a higher heart rate for longer. This happens by storing more energy and digging deeper. Those happen the week before the race and during the race respectively. That best fit line is a great predictor of race results. Based on my fitness any year, I can make this chart and use it to calculate my pace for any distance race with relative accuracy. The one thing I need to know is how long I can sustain a certain maximum. For 2.6 hours I figured I could hit 170 but was shy of that. For my 11 hour marathon I was aiming for 140. Will I try to break 2:37 again this year? I’m really not sure at this point. I still have five months until the end of the year and as of now I am signed up for the NYC Marathon in November. It would seem I could just train a bit more and then hope for a better race. The trouble is my third child is due in a month and I’m not sure that I will be able to train (or even just sleep) for the months following that. On top of that NYC is a slower course with more crowd and logistics issues. I would have to be a good bit faster to even hit the same time, let alone go six minutes faster. For now I’m going to take a few weeks to rest and then take it week by week. Congrats on an awesome race. That surface + running alone, pretty amazing performance! So this was a very cool race recap. I can relate because even though I didn’t run the same exact race. 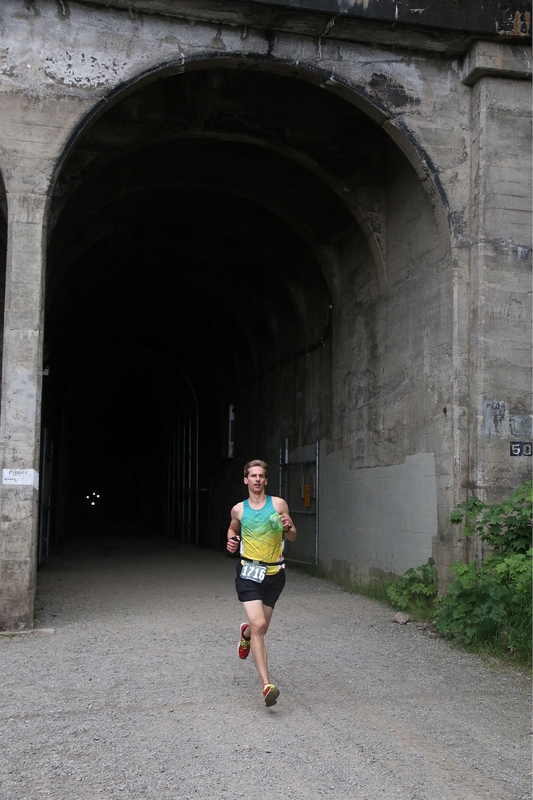 I ran the same route at the Super Tunnel Marathon back in 2016. It was fun to read another person point of view on the race. I’m looking to possibly run it again this year but this time with racing flats instead of trail shoes. I think that will shave off a little time as long as I don’t get rocks in my shoes. As for your time it’s awesome and you really can’t complain it’s your first marathon and an incredible time. I’m curious if you ran a half prior to this race to gauge where you were at physically before going into this marathon. Anyways thanks for the info and look forward to reading your NYC race recap which I’ll be running as well this year. I’ve actually never run a half marathon. I did do 13 miles at race pace on the course as my workout one day, which let me know I was in close enough shape to go for my goal.